Dennis Isom founded Isom Crane & Rigging Safety Specialists with the aim of reducing accidents and enhancing professionalism in the construction industry. An absolute essential piece of machinery for a large project, the crane can be a job site's most useful, yet most hazardous piece of equipment. With more than 36 years experience in the field, Dennis has trained hundreds of operators and consulted in the safe use of cranes in hundreds of job sites. He is considered one of world's top industry experts and has traveled the nation giving training, consulting and serving as an expert witness in accident litigations. 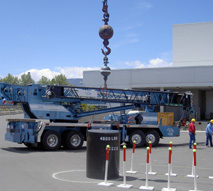 Dennis has developed and refined a training program that makes learning crane safety an easy and enjoyable process. Contact Isom Crane today, to learn how they can bring safety and efficiency to your job site.